As a child I remember waiting for what felt like forever for the school holidays to arrive. My mum used to tell me that they will come around soon enough, but it always seemed to drag. Now that I’m a mum I hear myself saying the exact same thing to my children, and now it really does feel that as soon as one holiday is over with the next one is right upon us! So how can we keep our kids entertained throughout the holidays without it costing a bomb? Well, here are a few ideas of cheap and fun projects that the whole family can enjoy from the comfort of your own home. Every time I get the sewing machine out I am instantly surrounded by two excited boys. So we thought it would be fun for them to have their own little sewing project. They decided to make a really simple drawstring bag to carry their toy cars in when they go to visit family. They had loads of fun choosing the fabric and ribbon but don’t worry if you don’t have any at home, you wouldn’t need any more than a metre and this can be easily picked up cheaply because you don’t need to worry about the quality of the fabric, the kids’ just need to love the design. The cheapest way to pick up fabric is by looking in your local charity shops so don’t forget to have browse in there, and ribbon is just a few pence per metre so that’s always a bargain. Pebble painting is a great idea to keep your kids entertained for next to nothing. All you need to start is to grab a bucket and go pebble hunting! 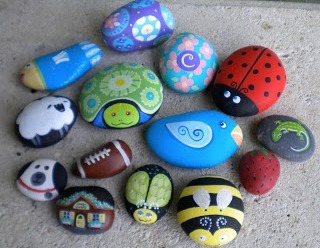 Once the kids have had their fun and found the best pebbles you can start decorating them. You can either paint them or you can use permanent marker pens (if you trust your kids with them). This is a fun and cheap project that you can spend hours doing as a family and you will have the painted pebbles to keep as a memento. If you want some inspiration for your designs then there are plenty of great ideas on Pinterest. This is another fun activity that you can keep for yourself or you can make enough to give them as gifts to the rest of your family. Mix all of the ingredients together in a bowl until it is the consistency of playdough. You can always add more water if you think it is needed. Then get the kids to shape it into whatever they want, it could be a heart, star or a simple circle. Once this is done your children can imprint either their hand, foot or depending on their age they could even write a little message using tooth picks. Oh and don’t forget to add a hole for hanging them up. Now you just need to bake them on a tray lined in baking paper for about 3 hours at 100c. Once this is done leave them to cool and then let the kids get messy with paint. Of course you don’t have to paint them if you don’t want to, the natural look of the salt dough is a great look as well. What cheap projects have you done with your kids that have kept them entertained for hours? I think I should try that pebble painting, I’m sure my daughter would definitely love it! We usually play with her dolls and I sew some dresses for her dolls.